520J10 POLY V (INDUSTRIAL MICRO-V) BELT. 52" Length, 10 rib Poly V Belt. Replaces SaniServe 58880. 520J10 POLY-V (MICRO-V) BELT. 52" Length, 10 rib Poly V Belt. Heavy duty J Section Poly-V 10 ribbed motor belt for exercise equipment, mixers, sanders, polishers & grinders, and electric motors for refrigeration and food service. 520J10 Poly V Belt fits Saniserve 401 and A4011J Softserve ice cream machines. SaniServe 58880 Belt (Poly-V 520J10). Select Life Fitness exercise machines. 520J4 Poly-V Belt. 52� Length. PJ1321/520J-4 Rib Motor Belt replaces fitness belts, compressor belts, drive belts, and electric motor belts. 520J-4 Micro-V Belt. 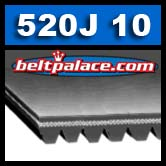 520J6 Poly-V Belt, Metric 6-PJ1321 Motor Belt. 520J6 Belt (6-PJ1321) INDUSTRIAL GRADE. 52� Length. 6-Rib PJ1321/520J belt replaces fitness belts, compressor belts, drive belts, and many other electric motor belts. 520J-6 Micro-V Belt. 520J9 Poly-V Belt, Industrial Grade Metric 9-PJ1321 Motor Belt. 520J9 Poly-V Belt. Industrial Grade. 52� Length. 9-Rib PJ1321/520J Drive Belt replaces fitness belts, compressor belts, drive belts, and electric motor belts. 520J-9 Micro-V Belt. 520J10 MICRO-V BELT. 52 inch 10 rib Poly V Belt. Heavy duty J Section ribbed motor belt for mixers, sanders, grinder, and electric motors for refrigeration and food service. 520J12 Poly-V Belt, Metric 12-PJ1321 Motor Belt. 520J12 Poly-V Belt. 52� Length, 12-rib PJ1321/520J Belt replaces fitness belts, compressor belts, drive belts, and electric motor belts. 520J-12 Micro-V Belt. 520J20 Poly-V Belt. Metric 20-PJ1321 Motor Belt. 520J20 Poly-V Belt. 52� Length, 20-Rib PJ1321/520J Belt replaces fitness belts, compressor belts, drive belts, and electric motor belts. 520J-20 Micro-V Belt.